If you’ve gone on Pinterest at all in the past year, you’ve probably seen lots of images of salads in mason jars. This isn’t just a cool way to photograph colorful vegetables, it’s also an awesome concept for packing lunch. The concept is simple: Fill a pint- or quart-sized mason jar (they are widely available at grocery and hardware stores or anywhere canning supplies are sold) with salad ingredients and bring to work. At lunch time, just shake everything out into a bowl and stir with a fork to mix. Seems simple, but there is a very important key to success. You need to layer the ingredients in the right order so the salad doesn’t get soggy before noon. Why a jar and not your usual Tupperware? The close quarters keep the layers separate, helping delicate items stay fresh. Salads-in-a-jar will typically last up to five days in the refrigerator, so make a bunch on Sunday for the week. One warning: Salads with cut avocados and bananas won’t hold up as well and should be eaten first. As with any salad, the possibilities are only limited by your cravings. Here are a few recipes to get you started. In a skillet over medium heat, brown the ground beef and drain excess fat. Add taco seasoning and water to the beef, stirring to mix well. Cook on medium heat for 3 to 5 minutes or until the liquid is absorbed. Set aside to cool. Take two clean, dry quart-sized mason jars and evenly divide and layer the ingredients in the following order: ground beef, tomatoes, beans, yogurt, cheese and lettuce. Preheat oven to 350 degrees. Toss the sweet potato cubes with 1 tablespoon of the olive oil and spread out on a foil-lined baking sheet. Roast for 20 to 25 minutes, stirring occasionally until lightly browned. Set aside to cool. Using a mandolin or a sharp knife, thinly slice the red cabbage. In medium bowl, toss cabbage with half the lemon juice, ½ tablespoon olive oil and a pinch of salt. Set aside. Meanwhile, in a medium saucepot, bring 6 cups of water to a boil. Add broccoli florets and cook for 3 minutes. Drain and cover with cold water. Set aside. In a small bowl, combine the yogurt, mustard, remaining lemon juice, water, salt and black pepper. 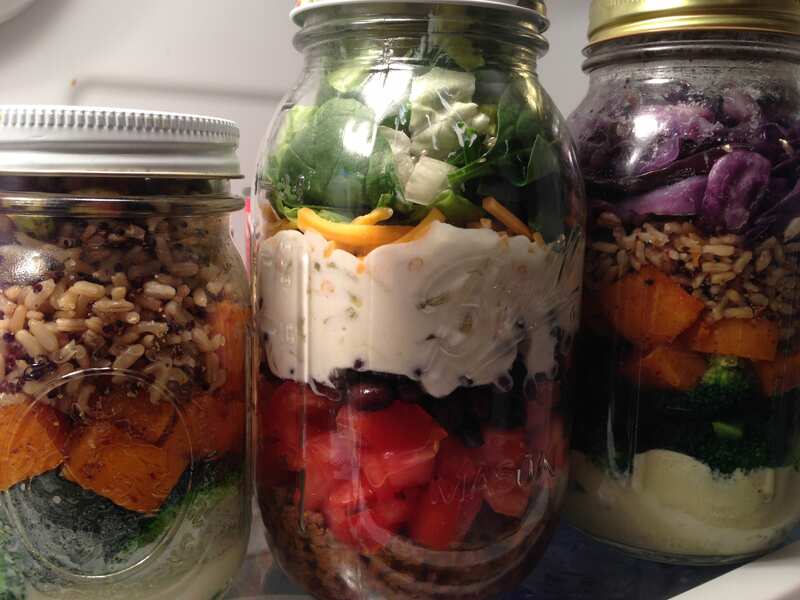 In two clean, dry mason jars, evenly divide and layer the ingredients in the following order: yogurt dressing, broccoli, sweet potato, brown rice and cabbage. What a great idea! Will try for sure! What a great and healthy idea especially for u working girls but anyone can do it sounds wonderful! And healthy!! !